Kristin Schutzman has known since childhood she wanted to be involved in medicine. Her maternal grandmother and retired nurse, Jean Corron, inspired her to pursue her dream. Her grandmother worked well past retirement age but decided to retire about two years ago to take care of her husband who has since passed away. where she discovered her love of learning and started to realize she wanted to go to medical school. “That was confirmed throughout college and during the application process for medical school,” she said. After graduating from Thomas More College with a major in biology and double minor in chemistry and Spanish, she was accepted into the University of Louisville medical school. 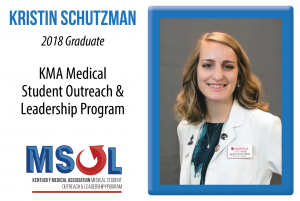 Currently a second year medical school student, Schutzman is interested in becoming a pediatrician. However, she was initially interested in cardiology. “There are a lot of heart problems in my family,” she said. After starting medical school, she’s had some experience working with kids, which helped solidify her interest in pediatrics. Last summer she did a pediatric internship at UofL where she got to spend four weeks shadowing a doctor and see patients on her own. She got to present patients to physicians, “which was a really cool experience,” she said. Schutzman is a 2018 graduate of KMA’s Medical Student Outreach and Leadership (MSOL) Program. She said the program exposed her to some of the aspects of the medical field that she doesn’t get to see in the classroom such as the business of medicine and the legal system— “things that really impact how we can practice medicine,” she said. For the community outreach portion of the program, she volunteered with Norton Children’s Hospital as a part of the Students Making Illness a Little Easier (SMILE) program, where she played with children to help them forget about being sick. She’s also helped rebuild houses for families in need through Housing Opportunities of Northern Kentucky (HONK), and she’s worked with Family Promise, an organization through her church that helps keep homeless families together. She helped set up the space where they stayed, served meals and provided entertainment for the children. In her spare time, she and her husband Craig, a third year medical student at UofL, like to check out the food scene in Louisville, visit family and friends in Northern Kentucky and see superhero movies—especially the Marvel movies—the day they come out. Craig is interested in possibly specializing in Emergency Medicine, combined medicine pediatrics or family medicine. They have thought about potentially working together someday. His sister is a nurse practitioner. “We’ve thrown around the idea of opening up a family practice someday,” she said.